..Wee Memories..: HI FRIENDS! BACK FROM MY HIATUS! HI FRIENDS! BACK FROM MY HIATUS! Hi friends, oh how I have missed everyone and my blog so much. Its been a rough few months for me and my family that I hope you can forgive my absence for so long. If you are my friend or follow me on facebook then you will know whats happened. If not, heres just a little update. The hardest was last Mothers Day when my Mom was rushed to the hospital. She hadnt told anyone but apparently she had bronchitis and because she had no insurance (her work didnt offer) she let it go and it turned into full blown pneumonia. Very very bad pneumonia. I wont go into all the details because its still so fresh and new and it will be coming up on one year soon but she was in the hospital for a very long long time and did not recover. She passed away over a month later in the hospital. There was nothing that could be done. My family and I were devastated, she is so young and was always pretty healthy as far as anyone knew or that she would let on. Its been rough, I miss her but more so my daughter and my nephew miss their grandma so much. She was always much better at being a Grandma than Mom. And I was happy about that because she was starting to change and come around for the better. It was harder having to say goodbye and not being able to talk to her was worse because she was intubated the whole time. I miss her everyday, its still fresh. So after that happened, life has happened to. But I will have some very exciting news coming very soon and I cant wait to share some new creations and fun crafty news with you. I still cant believe we lost Papercrafts Magazine and Two Peas in a Bucket. I really miss all the fun with both of them. Glad all the wonderful people are still around but I miss all the fun groups and the fun of trying out for publication. I am excited for my dear friend Vanessa opening her new shop, Butterfly Reflections Ink. If you havent already, check out her new online shop for crafty goodies its awesome and so is she! So proud of you girly!! I have lots more to share but I just wanted to pop in a lil note and say HI and let you know im back. I also just moved my Daddy in and my studio got kicked out into another room but I am enjoying having more space to do stuff with the kids and maybe I hope to teach or have some friends over soon. I also hope to have a new look to my blog soon with more of my sweet owls. :) Have a great weekend everyone!! Hope you are all doing well. 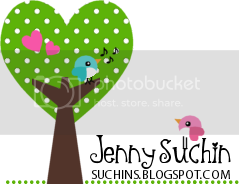 Lots of love, Jenny S. On a lil note if you havent been able to reach me, please go to my new email: jennysuchinATgmailDOTcom. My old email has been locked out and I have been fighting trying to get it back.